Whether one believes that form follows function or that function can follow form, a town or a city needs three key elements to be healthy. Firstly, a sense of place that includes the sacred is important to people to provide a basis for spiritual involvement. The city must then be able to reliably deliver safety and security to its inhabitants in order to grow and mature. And lastly, a city must provide the means of employment for its inhabitants. New Urbanism, in its quest to dictate the physical form of an urban development, has ignored the last key element. An examination of New Urbanism in developments in Central Florida shows a glaring lack of employment, raising questions about their sustainability and long-term viability. As we enter the second decade of Celebration, it is useful to look at this city and its influence on the surrounding region. Opened in 1996, Celebration incorporated much of the design philosophy that was formulated around the idea that a city should have a certain “look.” This design philosophy was promulgated to the general public in Suburban Nation, a book that lashed out at the current suburban form and proposed a new form based on a nostalgic notion about a golden age of American town-making, generally in the first decades of the last century. By regulating the specific architectural form of a new development, the New Urbanists proposed to improve the blandness, placelessness, and lack of character that is the lot of most contemporary suburbs. Celebration, sponsored by Disney, opened to white-hot press acclaim nationwide. Phase 2 was opened ahead of schedule due to demand for new homes. Market values of homes rose quickly beyond the norm for Central Florida. Developers took notice. Soon, other spawn of Celebration began to show up in Central Florida, and today we have several New Urbanist communities that aspire to the same level of success. Baldwin Park, funded by Chicago’s Pritzker family, is a smaller scale version of Celebration located in the City of Orlando and convenient to downtown. Avalon Park, in the southeast corner of Orange County, is accessed from the perimeter highway that is turning Orlando into a mini-Atlanta. Horizon West, the youngest of these, is due west of Downtown Orlando, and offers another New Urbanist antidote to subdivisions, adhering to the same formula of “live, work, and play.” All of these, including Celebration, are coping with the housing crisis, foreclosure crisis, and various other current market conditions just like the rest of us. Sadly the “live, work, and play” slogan, which comes from New Urbanist literature, does not bear out in reality. The notion is fine enough: that people can reduce commutes by living and working in the same community. During the supposedly halcyon days of pre-auto, early 20th century America, this was the reality for many Americans. One’s life could occur within a small, walkable radius, reinforcing itself and reinforcing the social bonds of a community. But the early 21st Century is very different than the early 20th and New Urbanist attempts to travel backwards in time have met with limited success. To work near where you live, there needs to be employment down the street. None of these communities have employment opportunities – jobs – down the street from the residences. The dwellers of all these communities get in their cars and drive to their jobs off-campus. New Urbanism thus becomes an after-6pm-and-weekend lifestyle choice, not a new way of life. 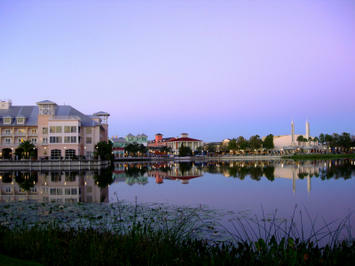 In Celebration, many of the early residents were Disney executives; only 4 or 5 years after opening did Disney develop office space in Celebration for some of their offices. Baldwin Park, approximately 2 miles from Downtown Orlando, never pretended to capture the employment aspect, instead selling itself (to many Celebration residents who rushed to this newer, hipper version of their town) as a downtown commute. And neither Avalon Park nor Horizon West have employment opportunities within their town centers. What they do have is easy access to the area’s ring road – ensuring vehicular congestion outside of their New Urbanist communities. What is in their Town Centers? Ironically, you find only a small shopping district and the ubiquitous Publix, Florida’s home-grown grocery store chain. The formula of “live-work-play” must stick in the craw of those who are employed in these stores, because the Publix employees, Starbucks baristas, dry cleaner cashiers, and others who do work in these Town Centers can not possibly afford the New Urbanist real estate. Rather than a social continuum (as was more common in the idealized version of America), there is a new social schism, with the New Urbanist underclass forced to commute to the New Urbanist communities from more affordable but less trendy housing nearby. In contrast, the region’s native communities have been thriving throughout the same growth period. Communities like College Park, adjacent to Orlando’s downtown, offer something that New Urbanist communities do not: diverse housing, from garage apartments and rental communities up to stately mansions, all within walking distance of each other. They offer an idiosyncratic mix of sacred places, playgrounds, schools, and shops in what the Philadelphia architect and theorist Robert Venturi calls “messy vitality.” No overarching body dictated the form, developed transects, or rigidly controlled the distance between the front porch to the street to achieve these vibrant, socially cohesive, and proud neighborhoods. New Urbanists claim to reduce the need for cars, but Orlando’s New Urbanist communities make the car more necessary than ever. Built on the periphery of the metropolitan area, they require a vehicle to complete the circle of functions necessary for a healthy society. Orange County planners have been submissive to the New Urbanists – especially after Celebration – but increasingly recognize that they do not solve the problems they claim to solve and instead invent more: higher traffic, less affordable housing near city centers, and lumpy development sprawl. The lesson for Orlando is to refrain from being seduced by the beauty contest that New Urbanists proclaim, and instead integrate all the key deeper social values such as safety, security, sacred places, and employment together. This is basic stuff recognized by greater minds – think of George Mitchell at the Woodlands or Victor Gruen in Valencia – who understand that employment constitutes a critical component to building a successful new community. Until New Urbanists learn this basic economic lesson, their contribution to our communities will remain sharply limited. Submitted by wendylowhy on Tue, 10/08/2013 - 03:26. Submitted by RodneyK on Thu, 04/16/2009 - 03:42. Financial vigor is indeed one element to consider the city a healthy one. With situation like that, we can now say that it is secured from a recession. Some says that even outer space is in a recession. Well, outer space isn't really in a recession – outer space has been constantly expanding since the beginning of time and will continue to do so forever, but commercial space travel is slowing down. Companies like Roskosmos and Space Adventures travel companies, have been seeing less business and now they can't book any more flights to the International Space Station because actual space agencies are using it. A flight through these companies costs more than any payday loan will cover, as it is in the dozens of millions to get booked. Turns out even the largest of a no fax cash advance doesn't matter in outer space. Why is New Urbanism a threat? Submitted by Matt on Wed, 11/12/2008 - 15:23. Form indeed follows function, but I don't see how that makes New Urbanism a threat to cities. As I look out my window, I see traditional rowhouses fronting city streets, interspersed with some vacant lots used for surface parking. During the years of urban decline, form followed function and buildings were demolished for parking, deemed to be the use more valuable than renovation and reuse. Now those lots are starting to get filled in again in the New Urbanist style. Form follows function as people are once again interested in living an urban lifestyle. In cities, New Urbanism is simply urbanism. The New part of New Urbanism is the adaptation of the old form to modern systems of finance, construction, regulation, and of course the regional location preferences of homebuyers (families with children want locations in good school districts), further constrained by land availability. This dictates that many NU projects will start as islands in suburbia. I don't see how that makes them worse than conventional suburbia, or a threat to anyone. Submitted by Matt on Fri, 11/07/2008 - 11:32. New Urbanist developments make easy targets because the marketing promises so much. I expect that's what makes so many commentators want to skewer them (the same reaction that postwar suburbia received, really). The author says that NUDs lack three things: affordability, diversity, and nearby employment. But these shortcomings aren't intrinsic to NUDs. Virtually every new development has the same flaws. These are side effects of modern regulatory regimes, production homebuilding practices, and employment markets, not NUD itself. Leaving aside the question of what "affordable" means exactly, when is new construction ever cheap? Whenever I see housing that is affordable, it is either (a) old, or (b) if new, poorly constructed, poorly located, lacking in amenity, and/or heavily subsidized. New, quality construction in a desirable location is never cheap in our era of regulation, costly materials and labor, and high expectations for amenities like multiple bathrooms. Historically, buildings tend to become relatively more affordable as they age. It's not fair to compare NUDs to older communities. They may be comparable in building style and perhaps in location, but not in age, and that is what accounts for the difference in price. Diversity is related to age. If you look at old photographs of streetcar suburbs under development, many were developed within a short period of time just like NUDs. And if you study the city directories from the time period, you will find that the homebuyers were pretty much of the same socioeconomic class. These neighborhoods became more diverse over time as homeowners came and went, as fashions changed, as building components wore out, as reinvestment occurred or didn't, etc. The other historical antecedents of NUD, classic main street towns, were usually gradual accretions. Lots were laid out, bought and sold on speculation, subdivided and consolidated; buildings went up, came down, and went up again. All this occurred amid minimal regulation. Of course these old towns ended up being diverse. It is simply too much to ask a new NUD, built within a short period of time under a master developer subject to modern regulatory constraints, to have the same level of diversity. But the design ingredients are there. Give it 50 or 60 years, and then make your comparison. As the author knows, and as any New Urbanist designer will tell you, modern employment uses are extremely difficult to integrate into the NUD context. Streetfront retail uses can be integrated, but these are not big employers. Any employment use of any size is going to draw from an area far larger than any nearby NUD. That means commuting, which, if you're not in a highly urbanized area with good transit, means lots of parking, which pushes everything apart. That makes even nearby major employment uses hard to integrate with an NUD. Also, employment markets are metropolitan. Any two-earner family, wherever it locates, is likely to have one or both people commuting somewhere else to work. Every development has the same issue; it's unreasonable to expect an NUD to overcome it. What NUDs do offer is the possibility for self-employed people and entrepreneurs to set up an office or shop within walking distance of where they live. Perhaps New Urbanist marketers have promised more than the designers and developers can deliver at first, but the the true test is how NUDs endure over time. Is the New Urbanism glass half empty or half full? In my opinion, it's half full, and will only get more full as time goes by. Submitted by daybreak man on Tue, 12/02/2008 - 00:04. I would have to agree with you. However, I think progress has already been made. I live in a NUD in South Jordan, Utah that was started in 2004. Promises were made in the beginning that most people felt to be fantasy. We now have over 6000 residents and our new village center is being developed. It already houses the corporate headquarters for Rio Tinto (West U.S.) which will house about 300 well-paid employees. The University of Utah is building a clinic here that will turn into a full hospital that will soon provide more jobs. We have two elementary schools with a junior high school on the way and the future only promises more with an extension of light rail into our community. Employment, check. We have a total of 10 home builders with various different models, styles, and types of housing. Each new village developed features new architectural styles. So we have everything from modern to the old-fashioned bungalow. This variety along with the unique attributes that can only be found in Utah give this development its sense of place. check. Home prices from 150k to 900k demonstrates affordability and variety in the socio-economic status continuum. All of the homes are energy-star certified and a few are even solar powered. There are really too many sustainable practices to list. All of these practices make living in the community not only environmentally friendly, they are wallet friendly as well. Affordability, check. Submitted by tewesley on Tue, 12/02/2008 - 07:42. I just wanted to say, as a Detroiter, 150k, especially right now in a rustbelt city, is still up there. It's rather easy to find a home under the 40k mark, ready to move in, and not neccessarily within the city of Detroit-there are plenty of newer homes in the suburban communities just as cheap. Certainly in an area where 900k homes, or at least from what I know from Detroit metro, 900k homes attract "900k businesses," the more expensive shops, galleries, boutiques, that someone making $7.85 an hour wouldn't be able to afford. Submitted by Richard Reep on Sun, 11/09/2008 - 21:20. New Urbanism has indeed overpromised; what is of greater concern is the battle of form that New Urbanism is preparing for our cities. Form follows Function, not the other way around. Submitted by deusami on Mon, 11/03/2008 - 15:02. Trying to copy designs from a time past when those questions seemed to have answers will not, on its own, provide those answers any more than dressing up as a Victorian will make me one. We are loathe to value the entire transect, giving priority to one or the other end when people live successfully (although differently) at all points along that continuum--neglecting the concept that they live there because it meets their needs. People in really great communities connected because of a shared sense of purpose, meaning and security, and they created those places out of those things. Whether those communities were urban, not so urban or downright rural was an outgrowth of who those people were, are, and are becoming. Cheap suburban environments may not grow up as attractively as others, but cheap urban environments aren't that pretty either. People choose traffic because of the payoffs, either in dollars, security, independence or community. That is not to say that good design principles are irrelavent. Celebration, Baldwin Park, Avalon Park, Oakland Park and many other communities do a good job with what they have. Walking and biking are great for mind, body, spirit and community security. Even as an exurb, the mix of local supporting uses does reduce trip length, so they are better than the alternative on that score. Celebration and Baldwin Park are beginning to create their own occupational centers and that helps too. As long as you are building on the fringe of an existing area (urban or suburban) there will not be a single purpose for that community and providing occupational uses for that project will only incorporate those uses into the fabric of the larger area. It is naive to think that these NU projects suddenly operate as if they were generated in a vacuum. Until other transportation choices are available, people in Orlando will drive--it's a city of new people. Few have lived here for more than a generation. Those who have were pioneers in a hot muggy place. They probably will drive even when other choices become available. Like LA, we may be too independent to do otherwise, for good or for ill.
We complain about not designing in accordance with context all the time. We just haven't looked at a large enough context. Submitted by mhelie on Thu, 10/30/2008 - 20:22. I've been blogging about the new challenge of dense sprawl lately, and if we don't start looking at this kind of development with more depth we are going to end up with a result even more catastrophic than the original sprawl was. Here the mistake isn't the New Urbanism however. The New Urbanism is only a product grafted onto the metropolis' actual urbanism, the ring roads. Those ring roads have no planning for natural urban growth whatsoever and just throw out the work to subdividers. Submitted by davebarnes on Thu, 10/30/2008 - 10:12. Every planner should be required to re-read Jane Jacobs every 5 years. She would agree with: "messy vitality". All of these planned environments suffer from "niceness" and homogeneity. Urban success REQUIRES some Class-D space and planners can not abide this type of low-rent space.